Hello, darlings! 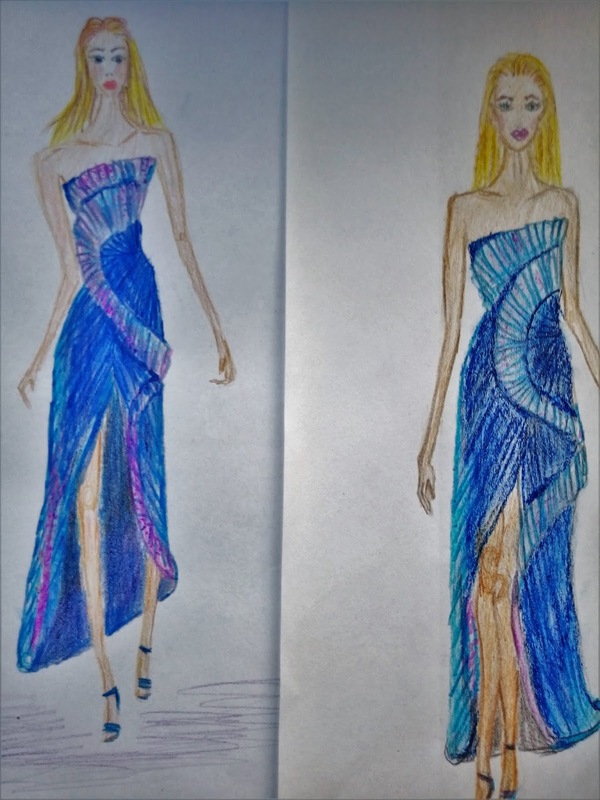 I'm back two fashion illustration of one Zuhair Murad dress. 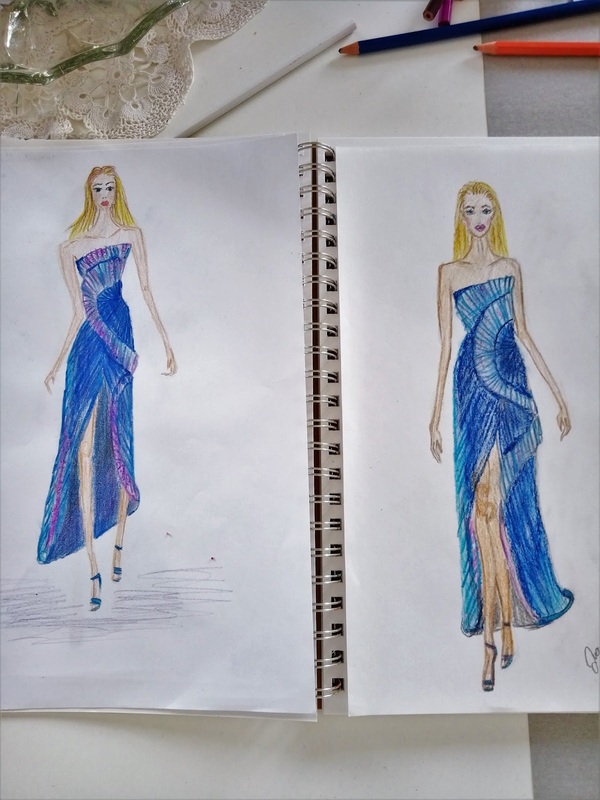 This blue gown is so beautiful I simply had to illustrate it twice. It makes me think of the sea, the mermaids and basically the good old 'day at the beach' vibes. There is something so liberating about spending time by the ocean, isn't there? I grew up in a coastal town, and I do miss the sea terribly. However, that is surely not the only reason why I loved this dress so much. You know, when I think Zuhair Murad the first thing that comes to my mind is- haute couture. I feel he is one of those designers who were simply meant to make couture. Do you know what I mean? Murad's designs are always so exquisite, glam and elegant. I do like his ready-to-wear collections, but there is just something about his haute couture collections that makes them stand out in the sea of others. 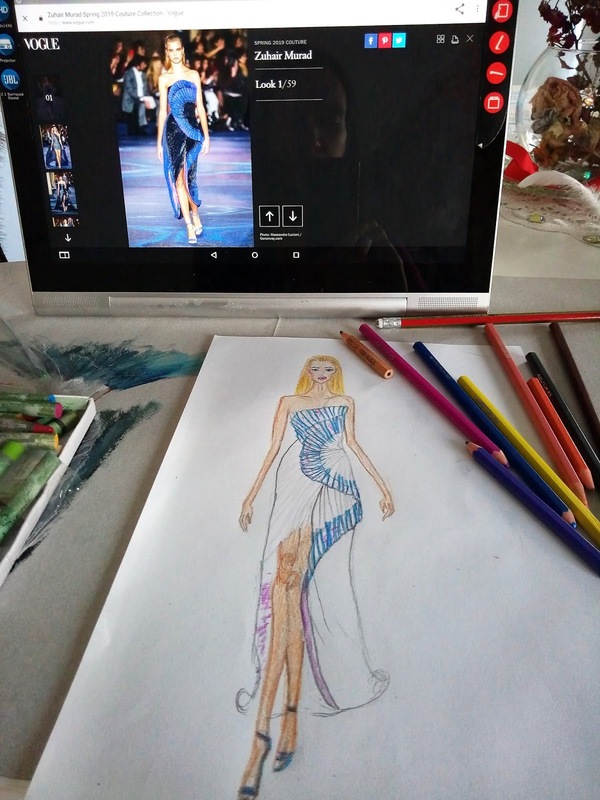 I already illustrated a dress by this designer (here), and with the fashion week on its way, I opted for something more recent. At the fashion week, I liked his other collection, but the couture collection was the one that really stole my heart. As soon as I saw this dress, I knew I had to drew it. So, I did. 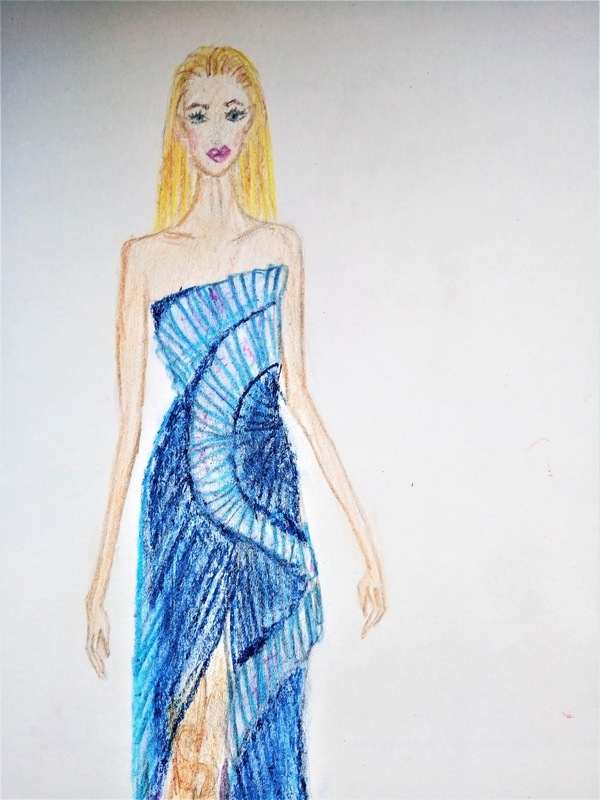 I illustrated this first look from Zuhair Muraid 2019 collection. 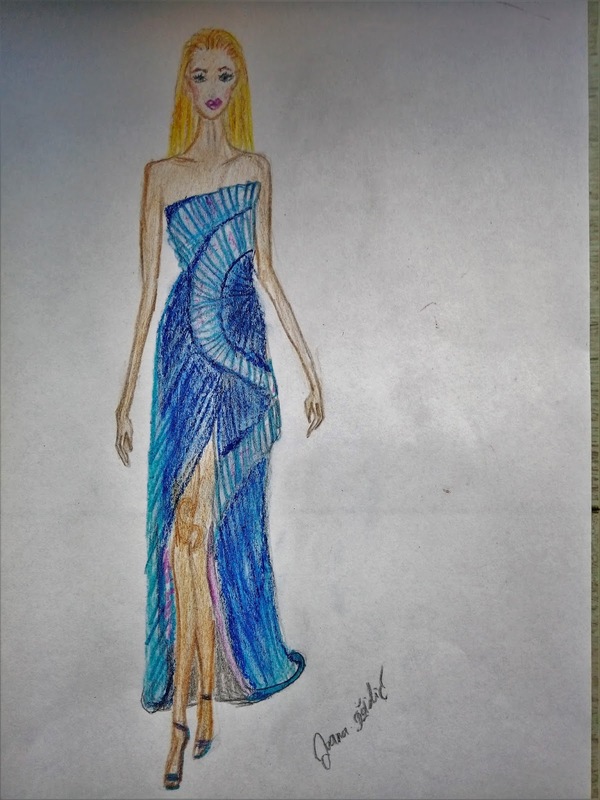 This gorgeous blue gown is absolutely gorgeous, isn't it? I illustrated a few similar designs in the past and this is exactly what I wanted them to look like. I tried to document the drawing process for you because I know some of you enjoy it. As for myself, I always enjoy 'work in progress' photographs of other artists, so why not take some of my own. The medium for both of these drawings is coloured pencils on paper. As you will be able to see, I first sketched them with a regular pencil, then I gently deleted most of the ordinary (grey) pencil and used coloured pencils to finish the drawing. Scroll down to see the wip photographs and tell me what do you think. Do you like both of them or is there one you prefer? If you do prefer one, tell me which one is it? I'm curious to know. I like them both, but I'm also not completely happy. Not because I think these drawings didn't come out right, I just feel I need a larger format to really capture to details. That is to say, I'm considering making another version of this dress. 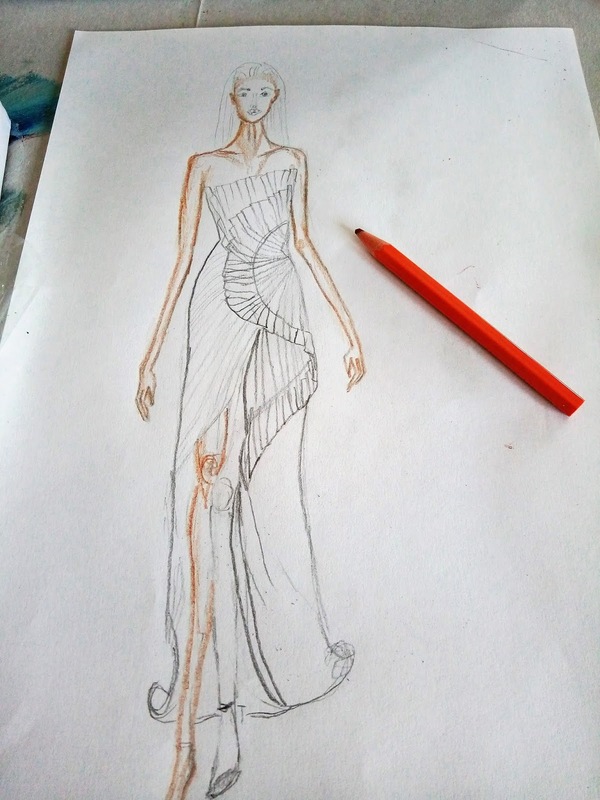 If I do it, that'll be the third fashion illustration of one dress, but why not? You already had the chance of seeing this drawing on my Insta account (sorry about the quality of the photographs, we've had rain for days and it can't helped) but here are more photographs of it. 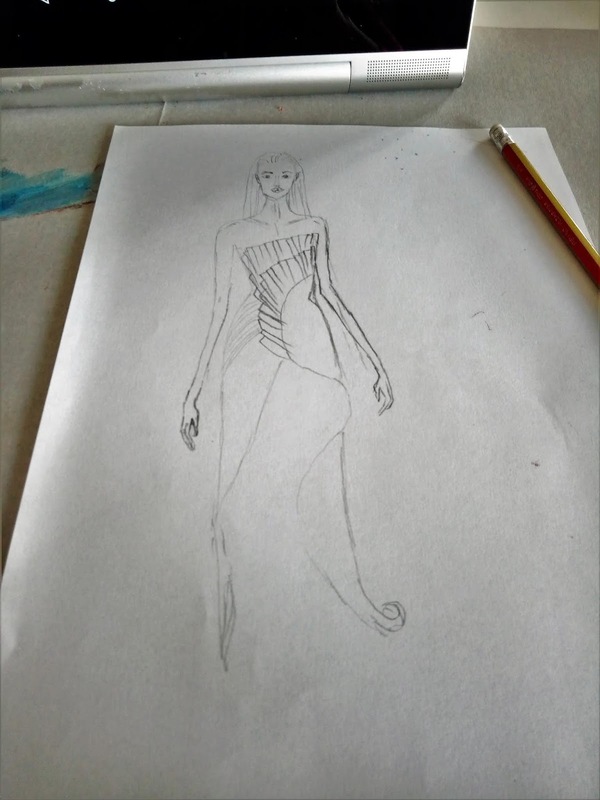 This one is drawn in elongated fashion illustration style, which basically means that it is drawn with measurements that aren't completely realistic (in the elongated fashion illustration style, the head is usually tiny and the legs are exaggerated in length). Personally, I like to try different illustrating styles but I often come back to this one. Blue and purple is such a gorgeous colour combo, isn't it? I remembered that I once drew a similar fashion design, so I browsed my blog and sure enough, I found it. Not just one! It seems that a combination of purple and blue is something I quite enjoy drawing. 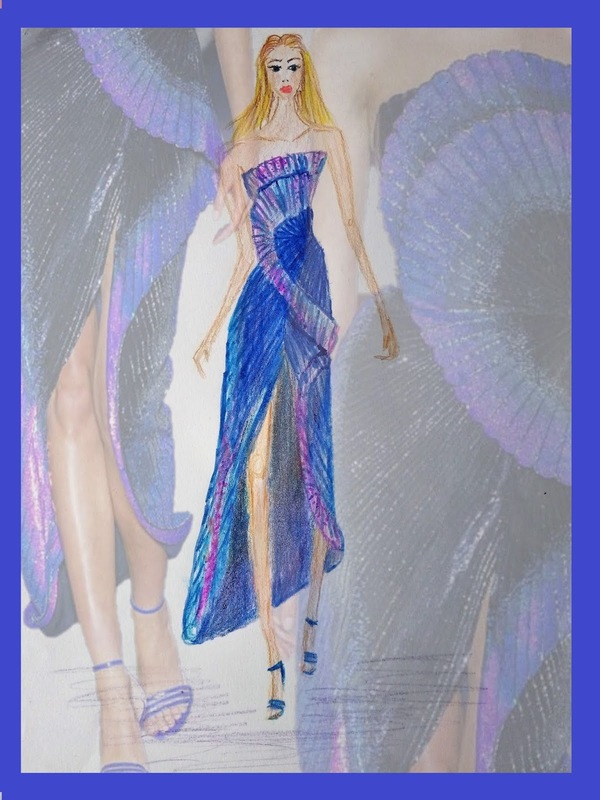 Scroll down to see that one and to move onto the other new fashion illustration of mine. 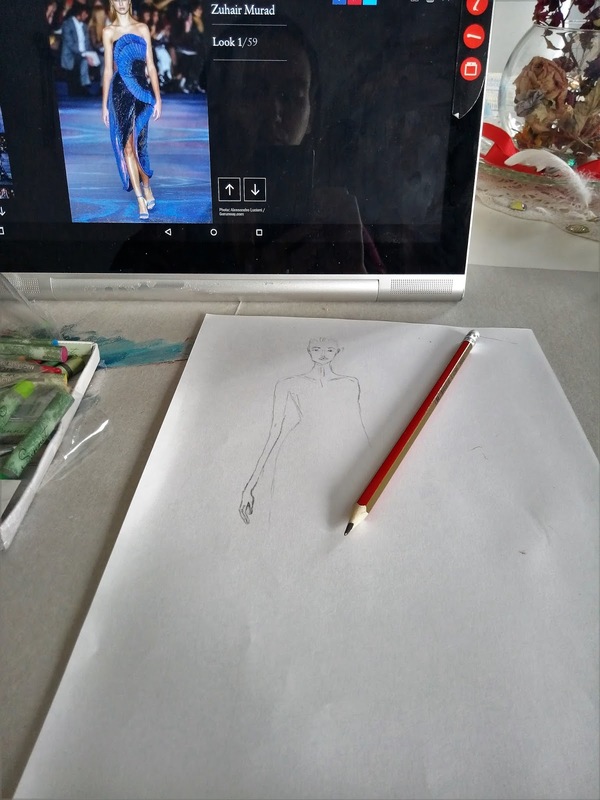 I tried to drew the second fashion illustration in a more realistic style (but still stylized). The medium is the same as for the first one, and so is my drawing method. I don't have a favourite between these two, but I'm happy I decided to draw two versions because I think that's always a good strategy. I'm come back! Good job dear as usual. Hai ragione sai ? quel vestito fa proprio pensare alle sirene! 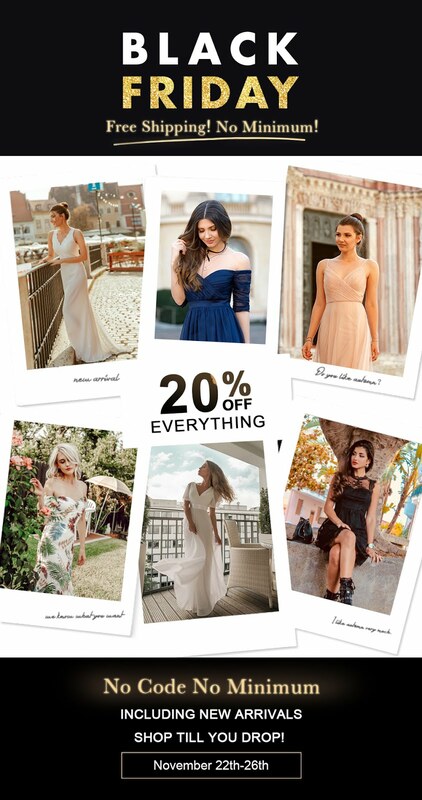 Anche io adoro lo stile di Zuahir Muraid, i suoi abiti sono un inno alla femminilità! 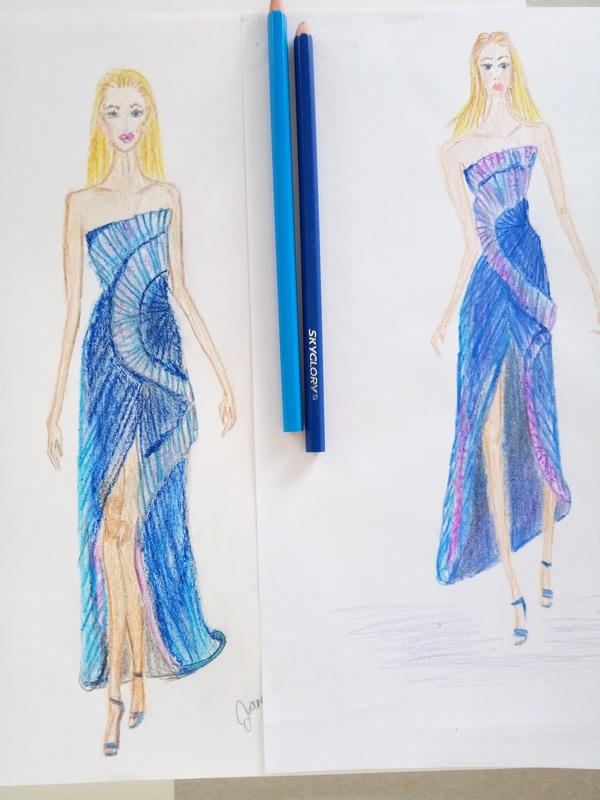 tra le due illustrazioni (entrambe molto belle) io preferisco la n.2 perchè mi dà l'idea di rendere meglio l'abito e mi piace di più la posizione della modella. 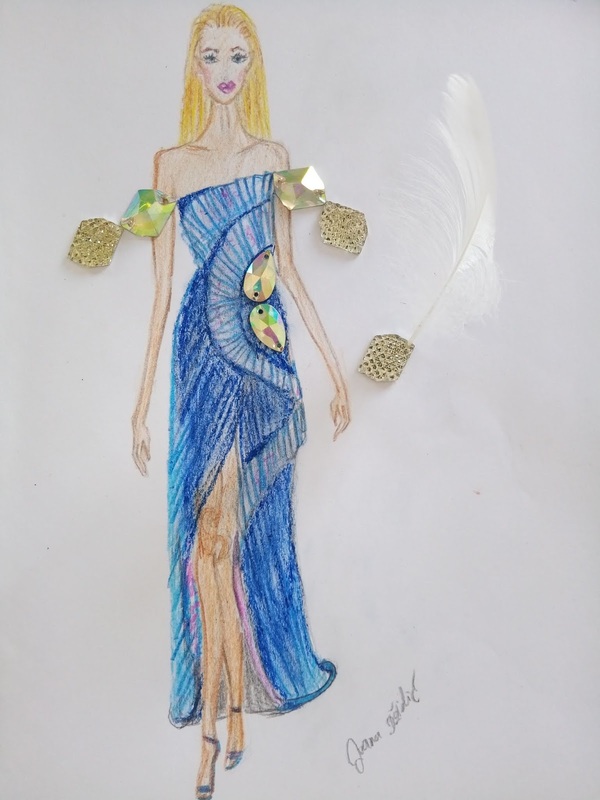 il vestito è stupendo, da sogno proprio e tu lo hai riprodotto benissimo Ivana, brava come sempre! This stunning gown is like a piece of art in itself. It's no wonder you were inspired to illustrate it twice. I love how you managed to capture the volume and movement in both illustrations! I do think that dress is spectacular! The colours are amazing too! Your illustration does capture it beautifully! I do like seeing the process too. I'm sorry if my plaster post upset you at all- I know you've had a lot of health issues and I meant the post a little in jest at my own irrational dislike of plasters- I know they do a valuable job. thank you so much. I didn't upset me, I just don't like to think about them. Wow...to think you use regular pencil and then use the colored ones. That is definitely a lot of work, Ivana. But this dress is stunning isn't it? The shape and curves of that ruffle, just add so much to it!! thank you Jodie. Art typically is a lot of work, but sometimes it is fun nevertheless. absolutelly perfect my dear :D loved it! 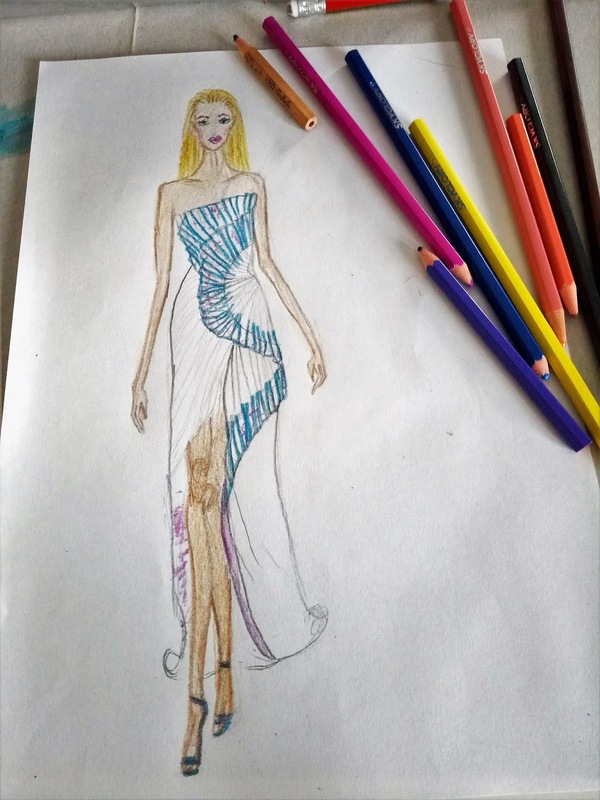 You did that dress justice with you illustration, Ivana. Such a talent! One more beautiful ilustration. The dress is so glam like you said haute couture. I live near the sea and I know what are you talking about. Thank you Karolina, I really appreciate it! Such a beautiful gown! makes sense that you were inspired to recreate it! Love everything about it! Thanks so much for sharing this! Will you check out my latest blog post and let me know what you think? thank dear, I sure will. 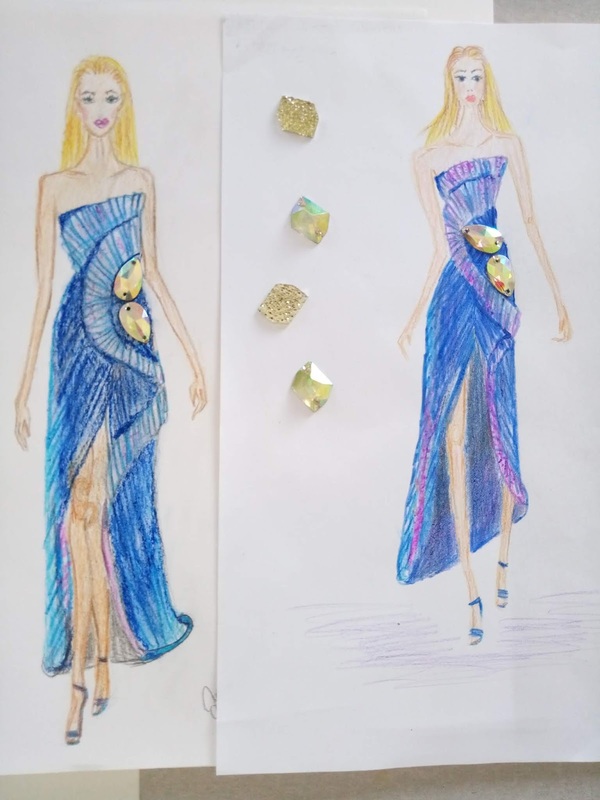 Adoro il suo stile e questo abito sembra davvero di una sirena, bellissimo il tuo disegno! Dear Ivana, no wonder you love that dress that much! I absolutely can understand this dress has for you the sea vibes you miss so much. 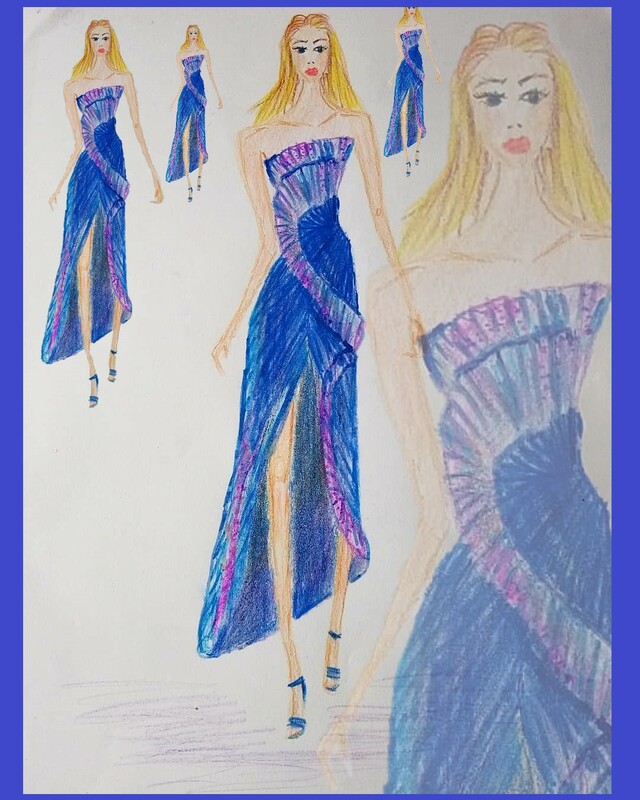 And I agree, the dress is very beautiful - and I would say your illustrations are even more beautiful. Thanks for showing the single steps, I find this always interesting to see and I'm again impressed by your illustration skills. Thank you Rowena, I'm glad you enjoyed it. Zuhair Murad have gorgeous dresses and this one is really special! 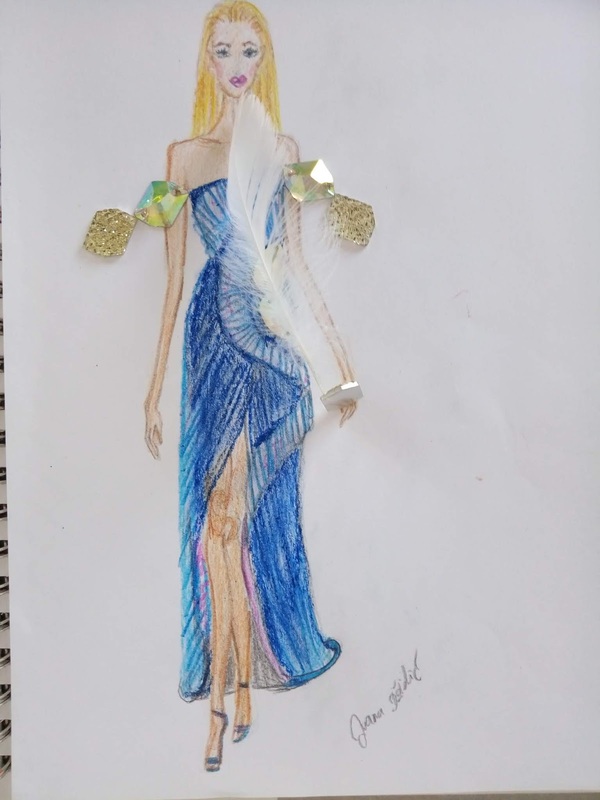 It looks like dress for modern Mermaid. Also I really like how you draw it. Amazing work! 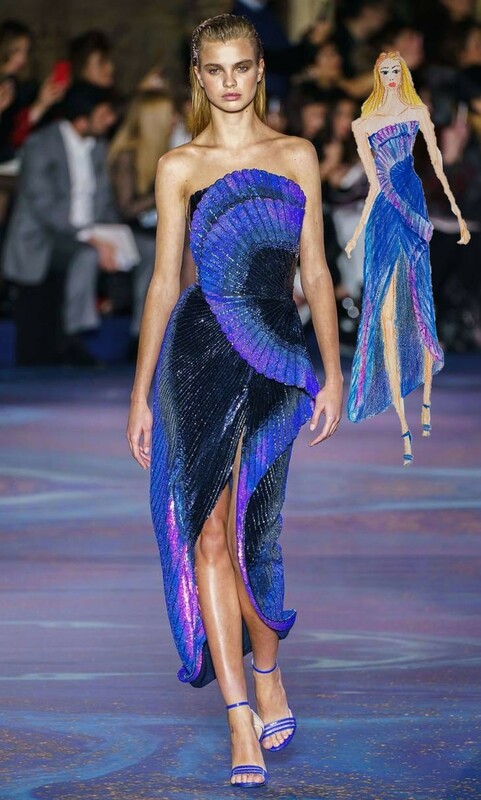 I love mermaids so I love the look of this dress! Wow, I swear that every time I come back to your blog you've gotten even better at sketching! This one is honestly my favourite, I love how you've used such gorgeous colours - the whole thing is flawless and I love it. I'm excited for the next one! as I always said, you are amazing! The gems really add a great 3D element in the second to last pic. You've done well on this one. <3 I love it. you are an artist babe! Ooooh, my Comment is away now! grrrrrrrrrrrrrr! sorry to hear your comment was deleted, it happens to me sometimes too! have a nice day, my friend! NEW PERSONAL POST | 6TH BLOGIVERSARY: AND THE MAGIC CONTINUES TO GROW! your design always fascinates me. 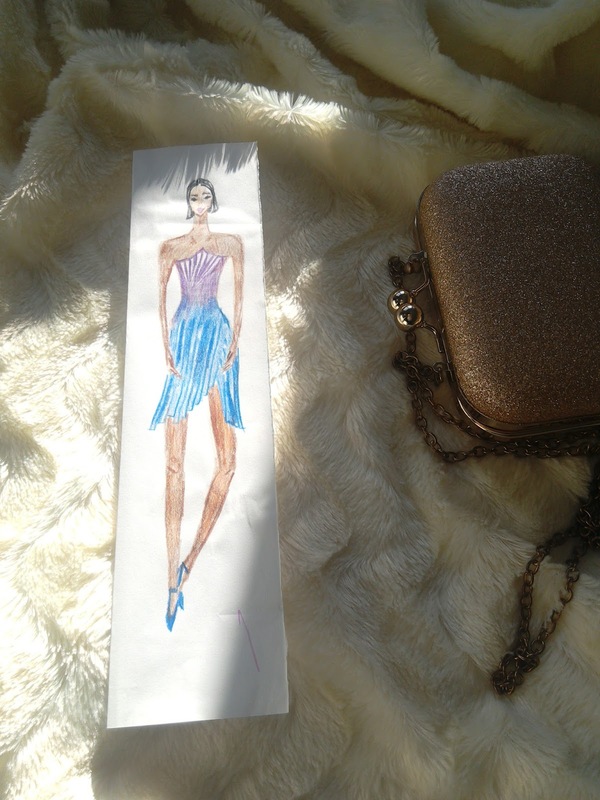 all the works you make are really good and the picture of the dress you made is always beautiful, I like it very much! Wow! You are so talented. This was done so beautifully! I love the touch of purple in this dress. Amazing one and so eyecatchy. But I truely love the cut. Very retro, I adore the kinda 80's cut. I see what you mean about the sea/ocean and mermaid vibes; the colour palette definitely has that serene vibe about it! Have a fabulous weekend Ivana! 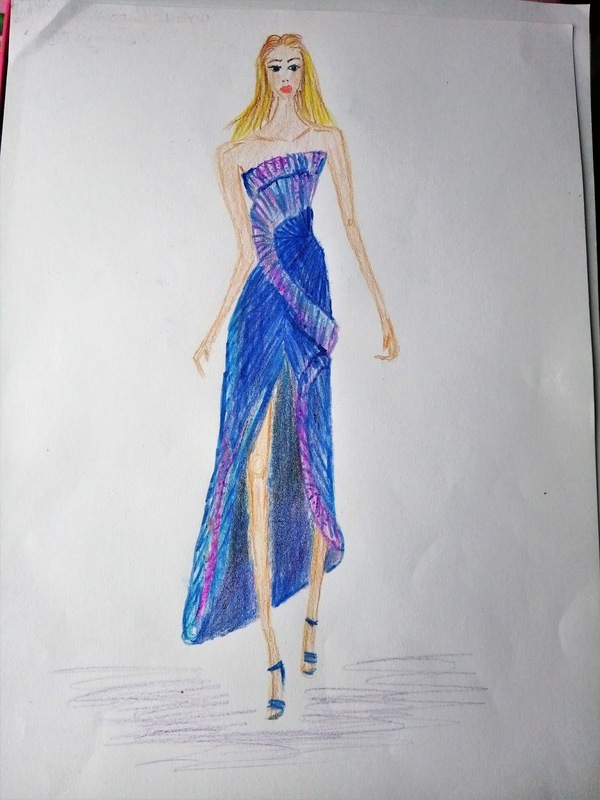 Great, it's a beautiful dress, blue is one of my favorite colors, keep drawing! Kisses. 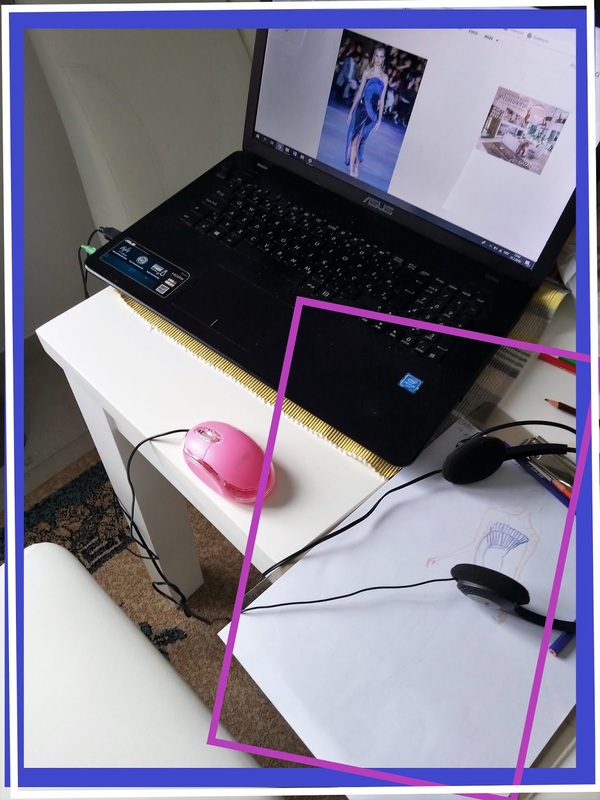 Hey Ivana, forgot to mention .......... Come join our Giveaway to Win Feng Shui Watches by Hochste Timepiece Worth Over $500 Open to All Worldwide! All looks amazing, thanks so much for sharing this with us. 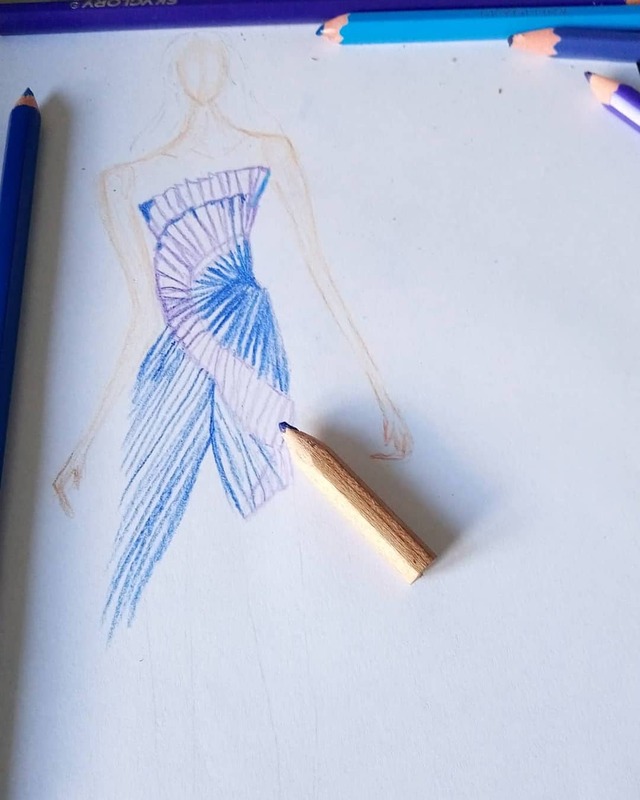 Che abito strepitoso e il tuo disegno è fantastico! Buona festa della donna, Ivana! Oh I really love this post. These illustrations are wonderful and I am very glad that you took us through this process. Certainly the gown is beautiful and I can see the inspiration for it. I especially like the fine illustration and the glitter and jewels, that captures the glamour of this. I hope you are enjoying this wonderful weekend. NEW REVIEW POST | JOWAÉ: HYDRATING WATER MIST. a great day for you, my dear! NEW FASHION POST | I CAN'T BELIEVE THAT THIS TREND IS BACK. NEW TIPS POST | FATHER’S DAY GIFT GUIDE – FOR LESS 20€. This dress is really good! NEW TIPS POST | BEAUTY PEARLS ARE SKIN BEST FRIENDS! I will, thank you so much. Wow! Your drawings are incredible!